I have to admit I was definitely disappointed with Hong Kong’s lack of street food. Street food is something that almost defines, to me, Asia and HK does not really have it. Too modern? Too clean? Too superficial? Too strict? I could go on for ever with questions like these. The bottom line is simple: HK does not have a real street food scene, neither its typical atmosphere.. but it holds something close. What happened, I’ve been told, is that during the 90s the government efforts to clean up the streets from “unhygienic eateries” resulted in today’s Cooked Food Markets. 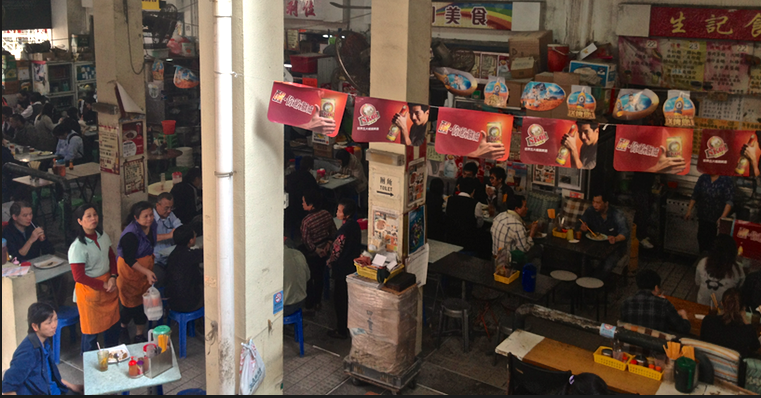 A Cooked Food Market is usually on a upper level of a market and boasts many little eateries on the sides with tables and chairs placed in the middle. There is at least one in each district and, together, they shoulder the heritage of a lost street food scene. The atmosphere is nice and “streety”. Loud, dirty enough, plastic chairs, plenty of choice and cheap. Beers for around 10HKD, dishes for 30 – 50 HKD, lunch sets (with drink) for 30-40HKD. Ah, and being Hong Kong the most internet loving place on earth, Cook Food Markets also have free gov wifi for 1h a day! Highly recommended if you’re travelling on a budget and don’t mind (or do appreciate, as I do) a less hygienic and fancy looking place to eat.